If you know anything about cattle, the name “Herefordshire” is going to conjure up one image and one image alone: the Hereford cow. And for good reason - this hardy breed of cow was bred and exported around the world, and has become an incredibly popular beef breed in places like the United States, Australia and all over South America. Herefordshire and the Hereford cow even donated their name to places like Hereford, Texas. But this vast, rural county is more than just cattle. Comprising a large amount of the Welsh borderlands, Herefordshire was at one time a prominent battleground between the Welsh and the England. 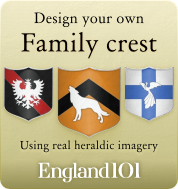 It is for this reason that Herefordshire is home to dozens of castles. There are some 130 castles in the county alone, many of them rather impressive Norman strongholds that remain in excellent condition. Hereford Castle, for example, located in the small but hardy county town of Hereford, was originally a motte-and-bailey castle that was extended and further fortified during the 12th century. 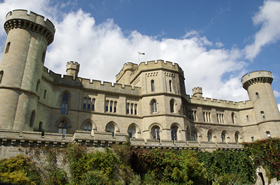 Alternately, Eastnor Castle is a picture-perfect faux Georgian castle built in the late 19th century. Herefordshire is an incredibly rural count, making it perfect for agriculture, especially apple and pear orchards, which thrive on the rich soil and abundance of rainfall here. Thus, Herefordshire is well known for its cider production, with most of the famous U.K. cider companies, like Westons, Dunkerton and British Bulmers being made here. The Cider Museum in Hereford traces the history of the beverage. 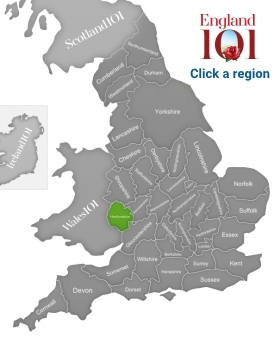 Being a quiet and rather unassuming place, fairly few famous people have ever come out of Herefordshire (which is, in truth, fine by the locals!). Among the more well known Herefordshire faces is Richard Hammond of Top Gear fame, who lives in a mock castle in the village of Weston-under-Penyard. 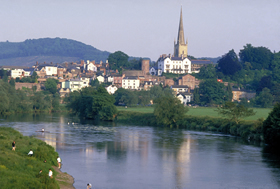 A view across the river Wye to the small market town of Ross on Wye, with the church spire dominating the skyline. Family relaxing on a bench on the Malvern Hills on a sunny day in Herefordshire. 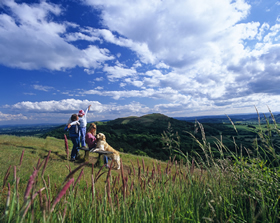 It has been designated by the Countryside Agency as an Area of Outstanding Natural Beauty. 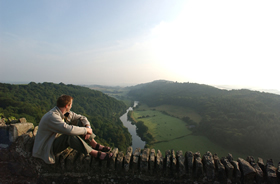 Man admiring the view across the Wye Valley and Forest of Dean, Symonds Yat, Herefordshire, England. 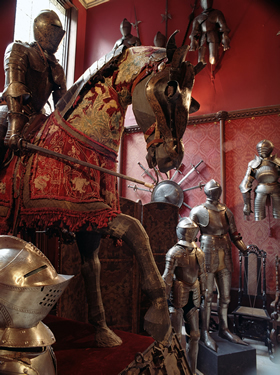 Part of the famous Meyrick Collection of medieval armour in the Red Hall at Eastnor Castle. The 19th century Eastnor Castle, in the dramatic setting of the Malvern Hills and surrounded by a beautiful deer park, arboretum and lake, is by any standards an massive edifice. 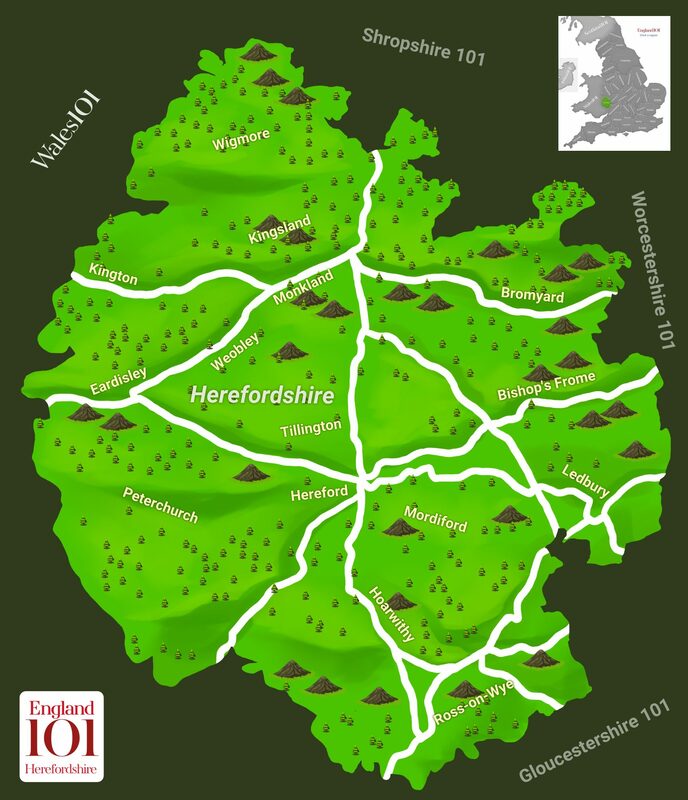 How much do you know about Herefordshire ?